Theatrics, vocal chops, fashion—Ash Costello has it all. The singer for California’s New Years Day champions a vigorous brand of gothic hard rock that’s so solid live, it’s obvious these guys (and gal) paid their dues playing countless shows and earning one fan at a time. One-on-one, Costello is friendly, charming and radiates positive energy. She spoke with Anne Erickson about the band’s new album, “Malevolence,” her killer fashion sense and how she thrives as a woman in a largely male-dominated business. Anne: You’re known for having a great fashion sense, both in your everyday life and on the stage. How do you express yourself through clothing and makeup? Ash: Well, first of all, thank you! I always tended to stick out. Even when I was in middle school, I couldn’t just wear what was available to me. I had to find something that really spoke to me. The way I look that clothes wasn’t that they were clothes, it was that they were pieces of a collection. Even if it was something simple like a pair of jeans, I felt like I was expressing myself in a certain way. I’ve always put thought into whatever I’m wearing, even if it’s something as simple as a ripped pair of jeans or a boyfriend’s T-shirt. I don’t know how to explain it! It’s not just clothes to me. I think that’s why it stands out in a way, because I mentally treated it differently. I truly look at my closet as a collection of pieces. I don’t go out of my way to think about it. It’s kind of second nature now. I used to be made fun of a lot for the way that I dressed. Now, the fact that people think the way I dress is cool just blows my mind! Anne: You have your own clothing line, Bat Royalty. What are your other favorite clothing and makeup lines right now? Ash: Yes, Bat Royalty is super fun, and it’s all kinds of fun clothes that I always wanted to see out in the world but hadn’t yet. As far as my favorite clothing lines, not really, because I kind of just pick stuff up everywhere. I really like the website Dolls Kill. They carry a bunch of different brands and have cool stuff, so I’m a big fan of them. But, I just pick stuff up as I go. I hate shopping, so as I move along in the world, if I see something cool, I pick it up. Anne: Your latest album, “Malevolence,” is very personal. What drew you to writing something so intimate this time around? Ash: I knew it was the only way to go. I had already said everything that I wanted to say on a superficial level, because New Years Day started out as this fun, kooky, spooky horror band, so I never had to dive deep emotionally, which I was fine with because I didn’t want to do that. Then, I was getting older and the band was getting older, and it felt like now, this was the direction to go, because the band was growing. The band was just kind of going in this direction, and I had to develop with it or I was going to hold it back. We knew we had to open up and do something a little more serious and personal, and I’m glad I did, because people seem to really like it. It was hard, though, to do something like that that was so personal. You get what you give ?????? Anne: You’re a woman thriving in what still is a largely male-dominated field: rock music. What are some of the positives and negatives about being a woman in heavy music? Ash: There are definitely a lot of positives, because obviously, the male and female ratio is way off, and there are way more guys. I feel like when a girl comes on stage, people are a little more taken aback and are more interested to see them. But, I also think we get lumped into the same category. A lot of the time, people come up to us at shows and say, “Oh, when I saw you, I thought you were just going to sound like these other female-fronted bands, but you sound totally different!” But that would be like someone going up to a guy band and saying, “Gee, I thought you were going to sound just like Iron Maiden.” So, I don’t know why people lump us into a certain sound just because we are a female-fronted band. It doesn’t bother me that much, but that’s pretty much the only drawback. Anne: What’s next for New Years Day? Any new music on the horizon? Ash: We already started writing for a next record. We’re taking our next record incredibly seriously. The last record we did in a very short period of time between tours and we were very busy, and now, we’re taking it more seriously. We’re starting seven months ahead of time! I’m gathering music and coming up with ideas, so we’re really putting a lot of thought into what we’re putting out there, which we’ve never had the luxury of doing before. I can’t wait to see how that pans out. 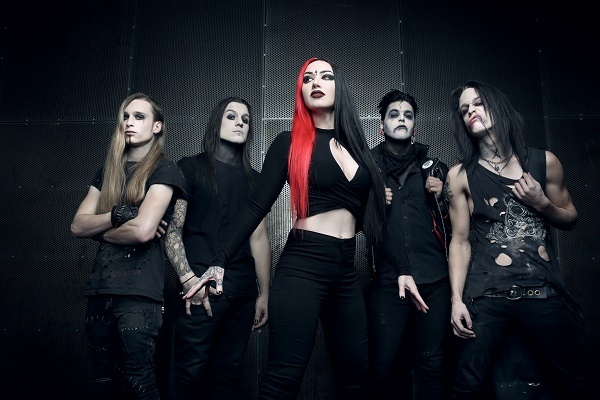 New Years Day is currently on a North American tour, and the trek reaches The Crofoot Ballroom in Pontiac, Michigan, on Monday (Nov. 14). Follow Audio Ink Radio on Facebook here and Twitter @AudioInkRadio.